Real quickly I wanted to share with all of you the sweet RAK I received from Yainea today! First - If you guys don't know who she is - she is one of the DT members of Lawn Fawn. I can't say enough wonderful things about her. She is UBER talented!! I first fell in love with her style when I saw THIS card. It took my breath away - and it tugged at my heart strings, because I have two "fur babies" of my own and they remind me so much of them!! Well over the last 6 months or so, I've had the pleasure of becoming friends with Yainea, and we've sent cards and "goodies" to each other, and really hit it off. Well - today I checked my mail, and what did I see - a RAK from my sweet friend! I asked her if she still had that wonderful card she made with the two kitty cats, and she said she did!! I was happy to hear that she still had it and hopes she is displaying it proudly in her craft area. To my surprise - I too, have one now! She remade that card just for me, and I am in awe!! She also sent to me a couple of Copics ( which we both love, but can guarantee you she uses them better than I do ) :o) and also some washi! This washi came all the way from Spain!! I am tickled pink by her sweetness and generosity! Yainea! You rock girl! I hope that this post doesn't embarrass you!! I just wanted to spread the word how awesome you are!! 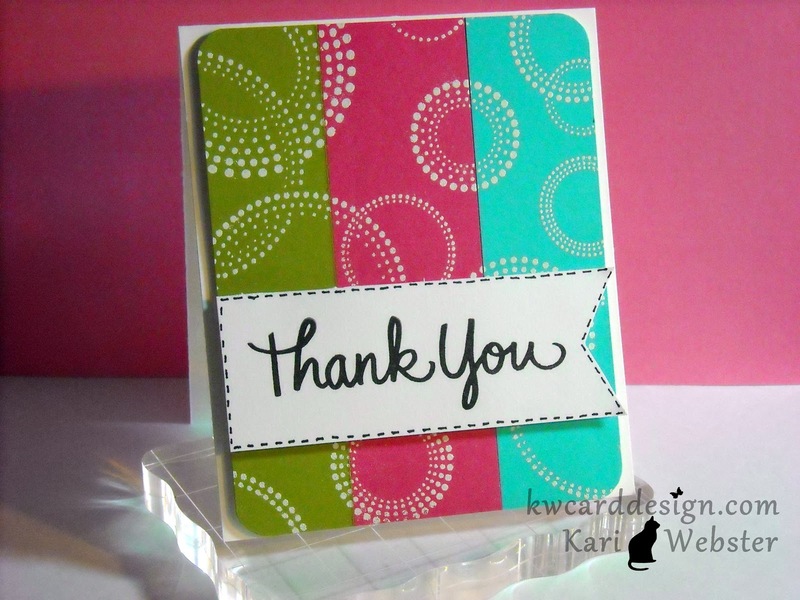 People that love Lawn Fawn will know how awesome you are anyway with all the beautiful projects you make! YAY! 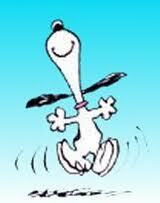 It's getting closer to Friday - and I couldn't be happier about it. I have some fun plans for the weekend - so I am ready to get it started. 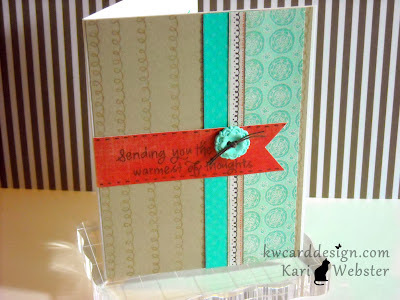 First things first though - I thought I would share a card today that ISN'T a challenge submission!! A good 'ole fashion card share!! 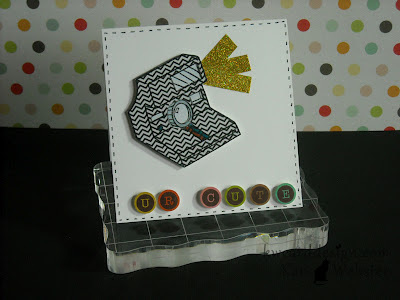 My card features supplies from Simon Says Stamp July Card Kit. I have had this kit for several weeks now - and I am just now diving into it. Sometimes creativity isn't an instant thing - it takes time for creative juices to flow - for me at least! 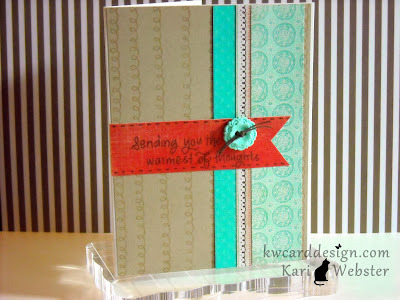 I started out stamping out a background onto this kraft paper which is Neenah Desert Storm card stock. 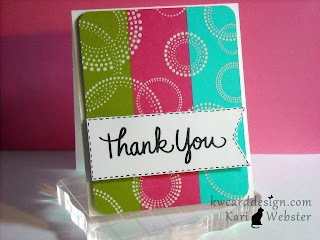 I used my new set from Lawn Fawn - Belinda's Borders. I love this set - and I can't wait to use it for many uses in the future! Then, I just cut strips from the pattern paper that was in the kit - this line is from Basic Grey - Paper Cottage. I adhered everything to my kraft card stock and then stamped out my sentiment from the stamp set that comes in the kit in Memento Ink - Espresso Truffle . This is one of the main reasons why I purchased the kit to begin with - this set is created by Kristina Werner. She is so awesome, and her handwriting is so lovely!! This lovely button comes from Chari Moss' Etsy Shop. If you are not familiar with her - she is on the Design Team for Lawn Fawn. She is a sweet, sweet girl - and awesome designer!! She makes these handcrafted buttons in many colors and styles, and now has dyed ribbon to go with her buttons. You should check out her blog/Etsy shop!! She's fantastic!! Pretty simple card really - but colorful and happy!! My favorite kind!! I'll return soon - until then stay happy and crafty!! Thank you again to Lawnscaping for allowing me to do this!! It was so much fun - and I hope to do it again soon!! Well, I'm back again this morning with another submission for the latest Lawnscaping Challenge. After I created my first card for this challenge - I had another idea in my head, and I didn't want to lose it, so I went to work, and this is my second card. 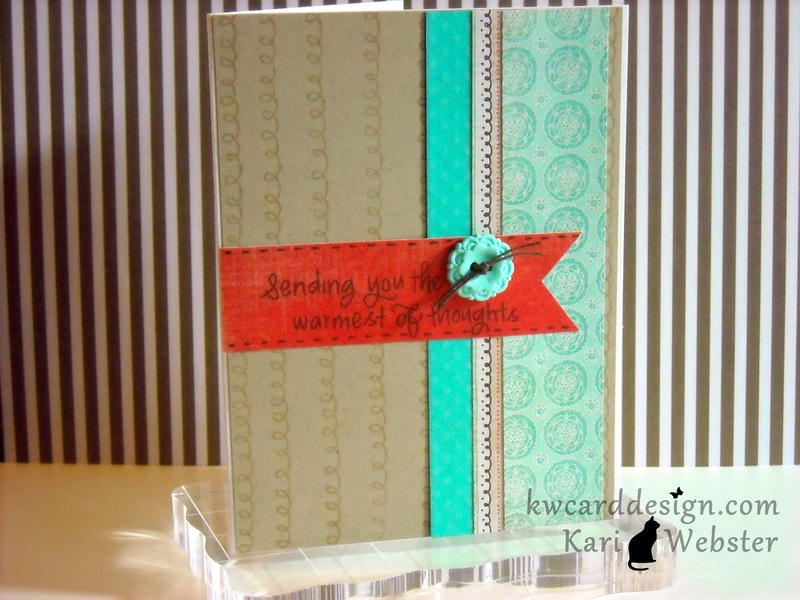 I went in a different direction with this card - bright, colorful and cheery. 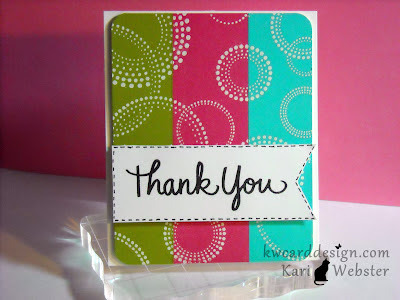 With this card - I created my "pattern paper" using washi tape. 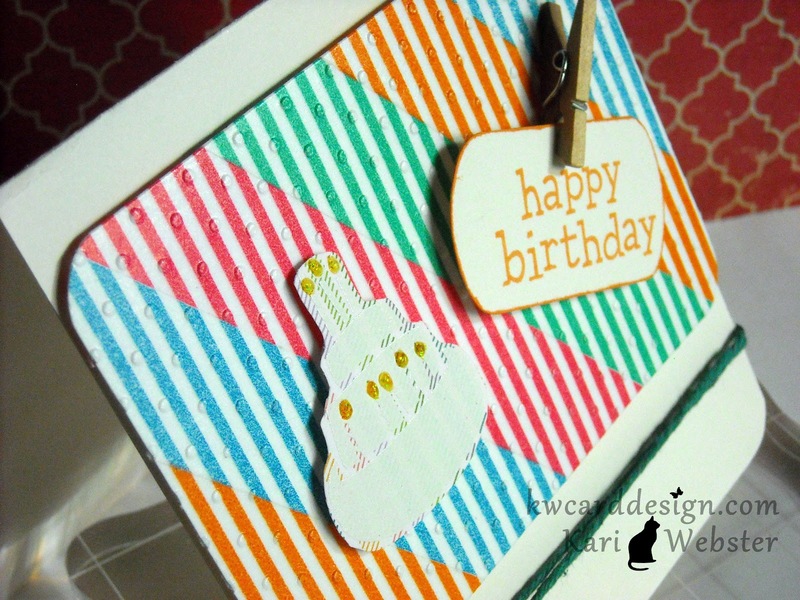 I have four different colors of this diagonal washi tape, and created this background, and to give it something a bit extra - I embossed it with my swiss dots embossing folder using my Cuttlebug. I used the Lawn Fawn set Year One, and I embossed the birthday cake in white over some papers from Lawn Fawn's Bright Side 6 x6 pad. 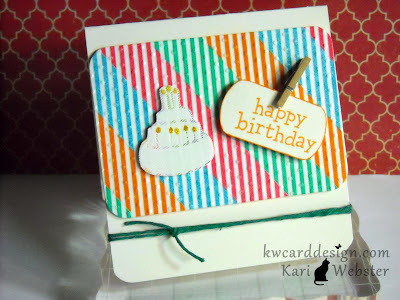 I stamped out my birthday sentiment from this same set in Tangelo ink from Memento, and for an extra fun element added a mini clothespin from SU! I put everything on dimensionals - because after all this challenge is about dimension. To finish off, I added some Lawn Trimmings from Lawn Fawn and some Yellow Stickles for the candles. Enjoy the rest of your weekend!! Happy Crafting!! Happy Sunday my friends!! 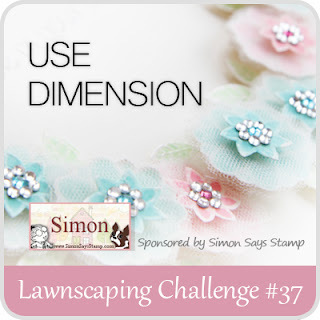 It is time for another LSC - and its all about dimension on your project! Dimension is so much fun, because it makes your card/ or page come alive! 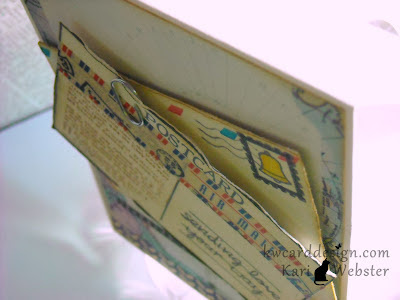 For my card, I used LF set You've Got Mail. I stamped out two postcard images - one for the postcard itself, and one to represent an envelope. I used some Old Paper Distress Ink to make them look vintage, and then added some text from my Newspaper Background stamp from Hero Arts. 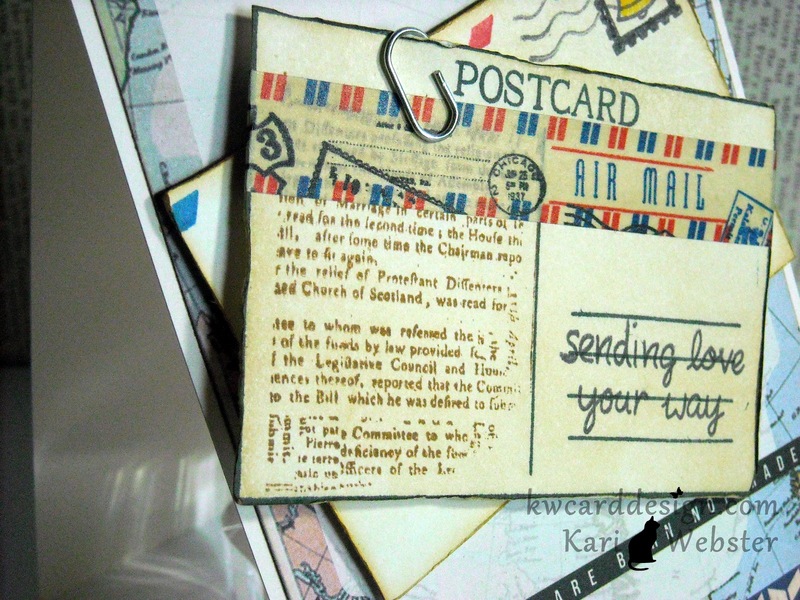 I added some fun air mail washi to my postcard! 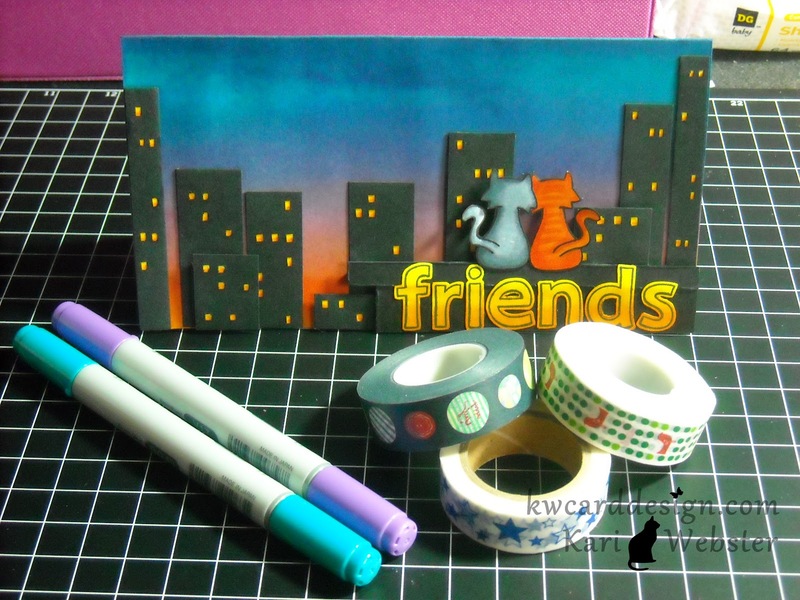 Loved this washi tape when I saw it on Etsy. 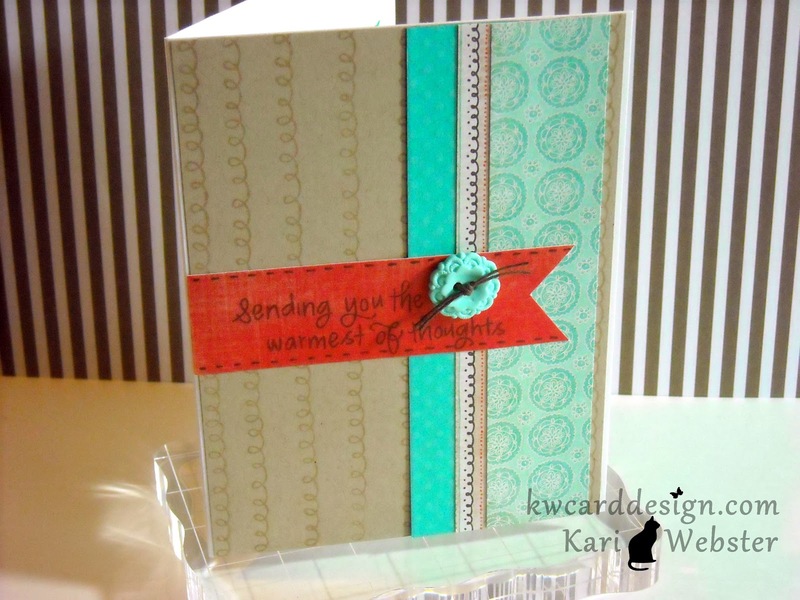 :) I added some paper from the new line from Kaiser Craft - Check -IN to my card base. Good Afternoon bloggers - First - To all the Canadians out there - Happy Canada Day! I'm back to share with you my submission for the latest CAS-ual Friday Challenge - Round and Round. Isn't there a song with that title?? Anyway, the challenge is to make a clean and simple card incorporating two circles - I technically used more - but the circles are intertwined :) I used a SU! background stamp for my design. Check it out. I heat embossed my background onto different colored card stocks from both SU! and Paper Trey Ink. I applied my color block panel with dimensional adhesive onto my card base which is Simon Says Stamp 120 lb weight card stock. 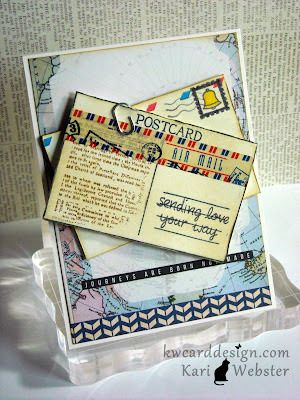 My sentiment comes from Stampendous called Happy Messages. 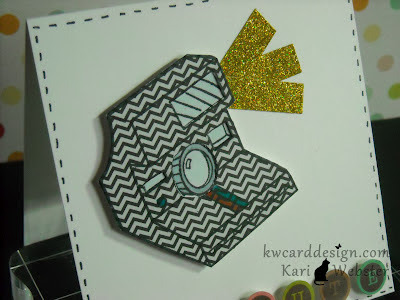 I also adhered that to my card with dimensional adhesive. Pretty simple card - but the different colored card stocks really makes this card in my opinion. Thanks for stopping in!! Have a nice rest of the weekend! !